Comfort Designs learned by listening closely to the community and understands what is required in bathing fixtures for assisted care. The needs of the resident and caregiver are given equal weight. 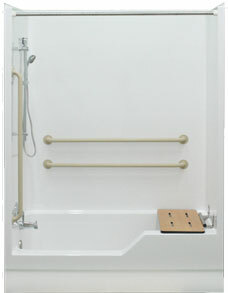 The goal has always been to enable assisted bathing while fostering independence and dignity for the resident. Design build model from Nationwide Children’s Hospital that found a place in assisted care. The low step dam and fold-up seat make this model safe and universal. Reinforced with steel backing plate.